D.Simpson Roof Rite - Fascia/Soffits/Guttering, Roofer, Windows/Doors/Conservatories based in Bishop Auckland, County Durham. 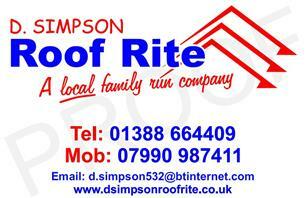 Welcome to D Simpson Roof Rite Services, local; family run company established 18 years. Give us a call for free estimates and roof check. Fibreglass and rubber single ply systems. We also supply and install roof coating systems which will totally rejuvenate your roof while also reducing your energy costs. We also supply and install Dry Ridge and Dry Verge systems.